Former Union Finance Minister P. Chidambaram on Sunday attacked the Modi government on the falling value of rupee and said the manner of implementation of the GST is an example of tax terrorism. The senior Congress leader also said that stagnant investment, fiscal deficit under pressure and the state current account deficit is having an impact on the macroeconomic stability. Asked if absence of a regular Finance Minister in the Modi government is responsible for the economic slowdown, Chidambaram said: "I thought there were three Finance Ministers -- one is de facto, one de jure, and one invisible." On the falling rupee, the former finance minister said:"The investment is stagnant at 28.5 per cent. You cannot expect the GDP to grow more than 7 per cent. "There is something known as Implemental Credited Output Ratio (ICOR). In India, we normally take four ICOR. You divide investment by Incremental Capital Output Ratio. It gives you an indication of the growth. If investment is 28.5 per cent and you divide it by four you will get a growth of only 7 or 7.1 per cent. "Fiscal deficit is under pressure. The current account deficit in 2017-18 has already touched two per cent and I am told that in the current year, it will cross 2 per cent. All this is having an impact on the macroeconomic stability," he added. On whether the Goods and Services Tax is flawed despite amendments, Chidambaram said that it proved that it was implemented in a wrong manner. "I think, there are still grievances, there are still complaints. GSTR 2 and GSTR 3 have not been notified. Tax liability is being decided by temporary GSTR form called GSTR 3A. If you speak to business persons... they still face numerous difficulties in complying with GST laws," he added. 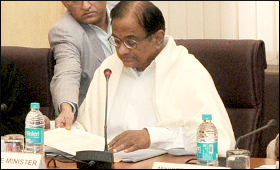 Chidambaram said that extraordinary powers have been given to various tax departments and humongous numbers of notices are sent out by every department. "It only creates fear among the individuals as well as business persons," he said. "Somebody who runs a medium-sized business gets a notice practically every third month... what is he supposed to do? Does the department have the capacity to deal with one lakh notices and two lakh notices? They don't have the capacity. Yet these notices are sent." Chidambaram said that since this government had a majority in Parliament it should have repealed the so-called Vodafone amendment to the Income Tax Act. "Far from that, they have sent Retrospective Tax demands to many other transactions. Vodafone did not turn out to be one-off case. There are several other cases where demands for tax retrospectively have been levied, which is frightening away investors. "The way the GST is implemented is an example of tax terrorism... you ask someone to file 37 returns in a year in a single state. If he has all-India business, he has to file over 1,000 returns. What else is tax terrorism?" he asked.